Essential Elvis Vol. 27 - Misc. This edition of the Essential Elvis magazine is a nice one, a great cover (Elvis in Ottawa 1957) and of course the first fan magazine interview with the (notorious) Dr.Nic(hopoulos). Fans opinion on his person differ quite a lot, so it is good Andrew Hearn talked to him the drugs / medicine and racquetball venture are subjects. We must say, Dr. Nic pleads "not guilty" on all charges. 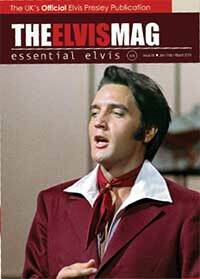 In this edition you'll also find an interview with Elvis friend and body guard "Dave Hebler".